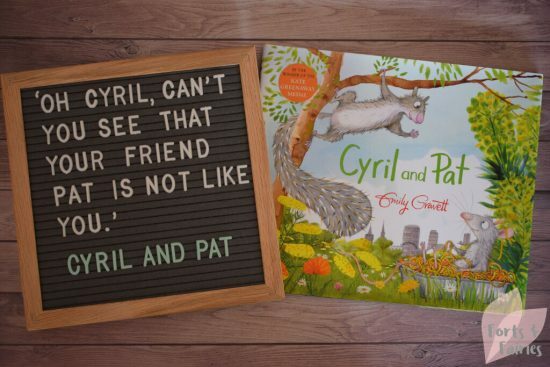 Cyril and Pat is a wonderful story to share together with your children, a beautifully illustrated book that highlights the importance of seeing through differences to embrace the joy of friendship. Cyril is a squirrel who lives in Lake Park, he’s alone and sad because he thinks he’s the only squirrel. That is until he meets Pat, and together they go on many adventures together and have lots of fun playing hide-and-seek, riding a skateboard, and outwitting a dog called Slim. From early on the reader will see that Pat is not a squirrel, he is in fact a rat. 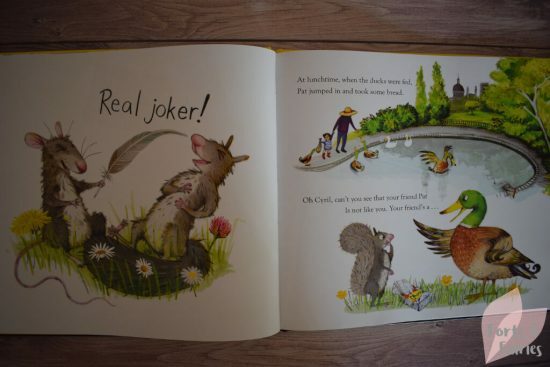 The book will tease a reveal of the truth to Cyril over a few pages, but rather goes on to say his friend is a joker and a sharer. At last Cyril learns that Pat is a rat, and is then told by the other animals that he can’t be friends with him anymore. Poor Cyril is once again alone, but soon lands himself in hot water when the games he plays go awry. Before long Slim chases him out of the park where he is cornered in the dark city. Luckily Pat, along with his rat friends, comes to his rescue and Cyril learns they can still be friends even though they are so different. 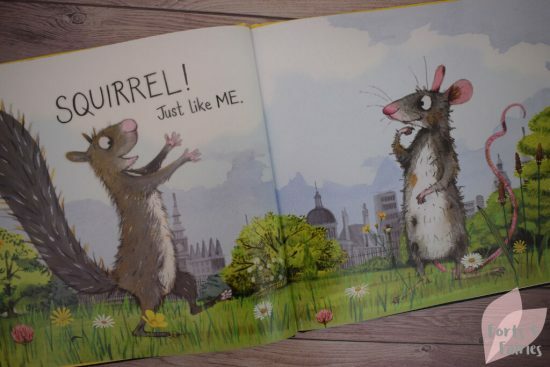 Written and illustrated by the talented Emily Gravett, I loved both the stunning pictures and the rhyming story that teaches valuable lessons of friendship and embracing our differences. Cyril and Pat is available in hardback from book stores and online retailers for a recommended retail price of R265. It’s recommended for children aged three to five years. Thanks to Pan Macmillan for sharing this story of friendship with us.